WASHINGTON — Ninety-nine days until the all-important midterm elections, Republican lawmakers and outside groups are beginning to distance themselves from President Trump — in ways both small and big. 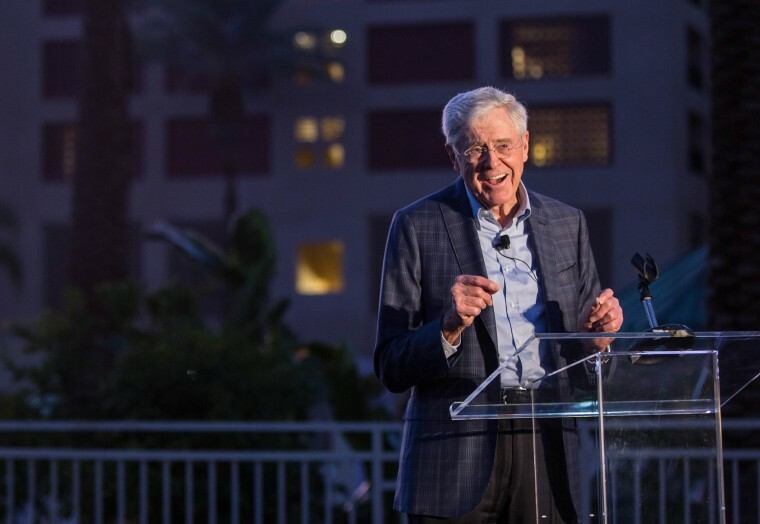 The latest to break away: the Koch Brothers. Two things can be true: More Republican voters than ever approve of Trump’s job performance, according to the latest NBC/WSJ poll. And on a variety of issues — tariffs, immigration, Trump’s dealings with Russia — we are seeing Republican lawmakers breaking from the president on key policies and issues. And that’s no small thing. Of course, in the summer and fall of 2016, Republicans were busy distancing themselves from Trump (over the “Access Hollywood” video, the attacks on the Khan family, the attacks on Judge Curiel). And it all worked out for Trump and the GOP. But you always want to be more unified — rather than less unified — heading into an election. For the record, Mueller’s probe has resulted in multiple indictments (including of Russian intelligence officials who were charged with interfering in the 2016 presidential election), multiple guilty pleas (for Trump aides like Michael Flynn, Rick Gates and George Papadopoulos) and jail time (for his campaign chairman Paul Manafort). The probe also was started NOT by the dossier but by Papadopoulos telling a diplomat, in the spring of 2016, that Russia had dirt on Hillary Clinton. NBC News has reached out to Mueller’s office for comment, but there has been no reply at this time. Also over the weekend, the president of the United States called for a government shutdown before the midterm elections. “I would be willing to ‘shut down’ government if the Democrats do not give us the votes for Border Security, which includes the Wall! Must get rid of Lottery, Catch & Release etc. and finally go to system of Immigration based on MERIT! We need great people coming into our Country!” he said. On Congress’ to-do list: keep the government open, oversee how the Trump administration is (or isn’t) reunifying migrant families and possibly another stab at tax reform. A Republican group began deploying its ground game: “Thousands of Republican volunteers were deployed this weekend in a ‘Super Saturday’ push to protect their House majority — knocking on doors, handing out flyers, and calling voters,” per NBC’s Shaquille Brewster.